NICKY TAM was built for a European whose plans changed so he didn’t actually ever take delivery of the yacht. Bought by this owner who was pleased to see a larger main engine, bigger generator, fully powered rig and many other nice upgrades aboard his new purchase. He and his family have loved NICKY TAM and have cruised the Caribbean and the Mediterranean extensively aboard her. 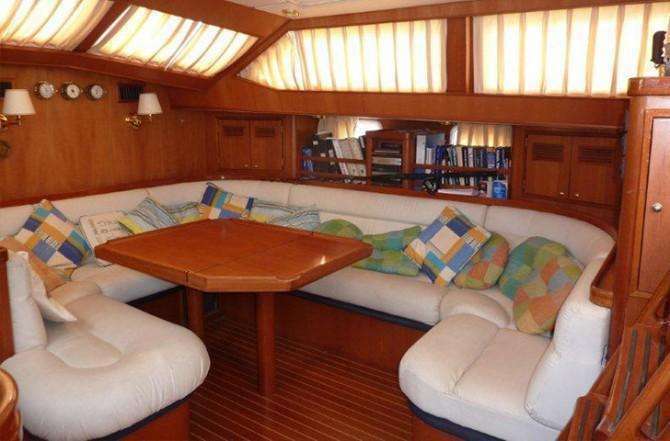 With a safe and easy sailplan, great honey teak interior beautifully executed by the Dutch, good owner’s cabin and 2 really smart guest cabins. The main saloon is flooded with light. NICKY TAM sailing from Port Grimaud to be with us here at Berthon. Before departure she enjoyed a mini refit with a full check over of her rig and seacocks, we have also done some additional works to get her in shape on arrival. She is looking forward to her next adventure.